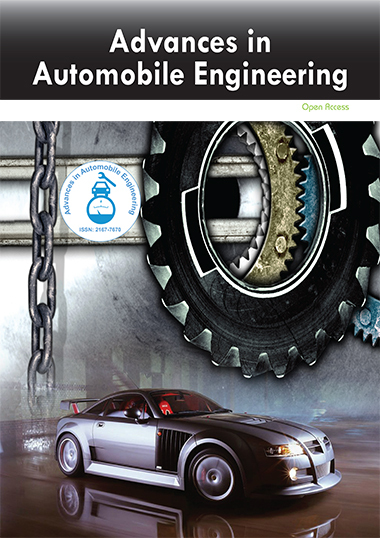 Advances in Automobile Engineering provides the quarterly publication of articles in all areas related to Automation Devices, Automotive Engineering, Computer Simulation, Diesel Engine, Engine Performance, Fuel Economy, Hydraulic Engineering, Machines, Signal Processing, Materials Science, etc.Advances in Automobile Engineering welcomes the submission of manuscripts that meet the general criteria of significance and scientific excellence. Papers will be published approximately one month after acceptance. Advances in Automobile Engineering is the Council Contributor Member of Council of Science Editors (CSE) and following the CSE slogan Education, Ethics, and Evidence for Editors. Longdom Publishingwill support authors by posting the published version of articles by NIH grant-holders to PubMed Central immediately after publication. The Journal of Advances in Automobile Engineering follows a progressive Editorial Policy that encourages innovation and analysis to submit the initial research, reviews and editorial observations as articles, well supported by tables and graphic illustration. Note: Authors are sole responsible for any scientific misconduct including plagiarism in their research articles; publisher is no responsible for any scientific misconduct happened in any published research article. As a pulisher we will follow strictly scientific guidelines and EIC's advice to retract or erratum of any article at any time if scientific misconduct or errors happened in any articles. Advances in Automobile Engineering is organized by Longdom Publishing, a self supporting organization and does not receive funding from any institution/government. Hence, the operation of the Journal is solely financed by the handling fees received from authors and some academic/corporate sponsors. The handling fees are required to meet maintenance of the journal. Being an Open Access Journal, Advances in Automobile Engineering does not receive payment for subscription, as the articles are freely accessible over the internet. Authors of articles are required to pay a fair handling fee for processing their articles. However, there are no submission charges. Authors are required to make payment only after their manuscript has been accepted for publication. In order to reduce delays, authors should assure that the level, length and format of a manuscript submission conform to Longdom Publishing’s requirements at the submission and each revision stage. Submitted articles should have a summary/abstract, separate from the main text, of up to 300 words. This summary does not include references, numbers, abbreviations or measurements unless essential. The summary should provide a basic-level introduction to the field; a brief account of the background and principle of the work; a statement of the main conclusions; and 2-3 sentences that place the main findings into a general context. The text may contain a few short subheadings of no more than 40 characters each. With an objective to make scientific and health care information globally available, Longdom Publishing has launched Translation Services. As per the interest of the scientific community from non-English speaking territories, we have introduced this new feature to facilitate authors to reach a global audience in many major world languages. Longdom Translation Services help the scientific community to have easy access to all scientific articles not only in English but also in French, Spanish, German, Chinese and Japanese. The scientific translations service grants a global presence to the authors and their research. Our language experts in Spanish, French, German, Chinese and Japanese translate articles from English to the desired world languages and vice-versa as per the author’s requirement. As an open access publisher Longdom Publishing does not get any financial contributions from other organizations. Authors who wish to use our translation services and who are interested in publishing their research in the above-mentioned languages are requested to pay the following charges in addition to the article processing charges. Formats for Longdom Publishing Contributions: Longdom Publishing accepts the following: original articles, reviews, abstracts, addendums, announcements, article-commentaries, book reviews, rapid communications, letters to the editor, annual meeting abstracts, conference proceedings, calendars, case-reports, corrections, discussions, meeting-reports, news, obituaries, orations, product reviews, hypotheses and analyses. Longdom uses the numbered citation (citation-sequence) method. References are listed and numbered in the order that they appear in the text. In the text, citations should be indicated by the reference number in brackets. Multiple citations within a single set of brackets should be separated by commas. When there are three or more sequential citations, they should be given as a range. Example: "... now enable biologists to simultaneously monitor the expression of thousands of genes in a single experiment [1,5-7,28]". Make sure the parts of the manuscript are in the correct order for the relevant journal before ordering the citations. Figure captions and tables should be at the end of the manuscript. If equations cannot be encoded in MathML, submit them in TIFF or EPS format as discrete files (i.e., a file containing only the data for one equation). Only when tables cannot be encoded as XML/SGML can they be submitted as graphics. If this method is used, it is critical that the font size in all equations and tables is consistent andlegible throughout all submissions. All works published by Longdom Publishing are under the terms of the Creative Commons Attribution License. This permits anyone to copy, distribute, transmit and adapt the work provided the original work and source is appropriately cited.